Now recorded in the 'modern' spellings of Wickliffe, Wycliff, and Wycliffe, this is one of the most famous of all surnames in Christian history. One of the earliest nameholders being John Wycliff, the religious reformer and arguably the first English protestant (see below). 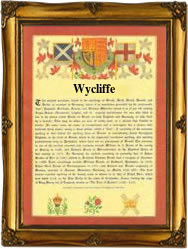 The surname originates from the village of Wycliffe, in the far north west corner of the county of Yorkshire, near Barnard Castle on the River Tees. The village is ancient, being recorded in the famous Domesday Book of 1086, the first known gazetter of land ownership anywhere in the world. This recording was in the spelling of 'Witclive', meaning 'The white cliff', the area being famous for its limestone. The later surname is a locational or 'from' surname. This is to say that it was given to people after they left their original homestead, and moved elsewhere. In the small communities of the Medieval Period, the easiest means of identification was to call a 'stranger' by the name of his, or sometimes her, former village. Spelling being erratic and local accents fairly thick, often lead to the development of variant spellings. In this case Wycliffe village was for many centuries on the front line of the endless boundary wars between the English and the Scots, and it is not surprising to find that the name is most often recorded a safe distance south! These recordings include John Whitcliv of the county of Somerset, in the Hundred Rolls of 1273, and John de Wycliffe, generally recorded later as John Wycliff, of London, and known as 'The Reformer. He was educated at Oxford University, and in 1361 was appointed Master of Balliol College, Oxford. However his tirades against the excesses of the church hierarchy were such that he was forbidden to teach his doctrines to his own pupiles. These included contentious issues such separate roles for temporal and spritual powers, and the fact that the Pope may legitimately be ignored! He died in 1384, but such was the feeling against him by certain 'authorities' that some forty years later his body was disinterred and thrown in a river. Other recordings include those of Johanna de Wyclaf in the 1379 Poll Tax Rolls of Yorkshire, whilst John Wicklif, of the church of St Mary Aldermary, in the city of London, in 1578, is given as being 'a relative of the Reformer'.